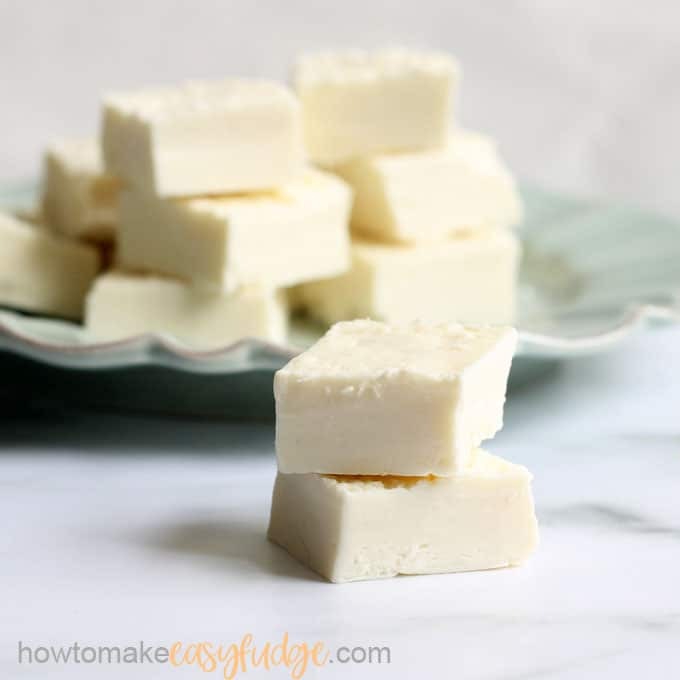 White Chocolate FUDGE: Easy 2-ingredient fudge you can make in the microwave! 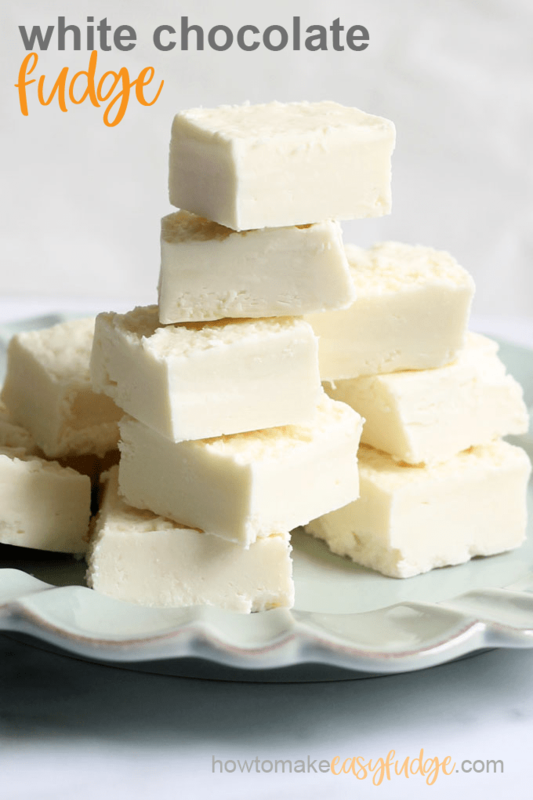 You only need TWO ingredients to make the best ever white chocolate fudge recipe. 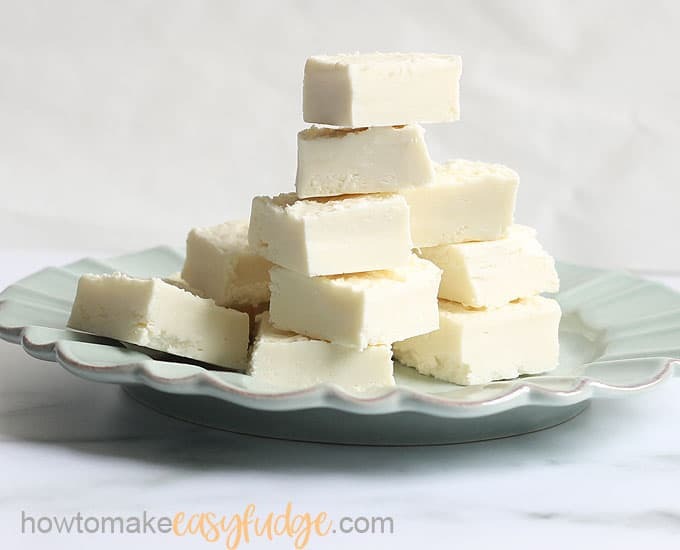 Combine white chocolate chips and a can of store-bought vanilla frosting for this easy microwave fudge, and you have a delicious, no-bake treat everyone will love. I’m not sure I’ll ever get over being stunned that a simple mixture of chocolate chips and a can of store-bought frosting make perfect, delicious white chocolate fudge. 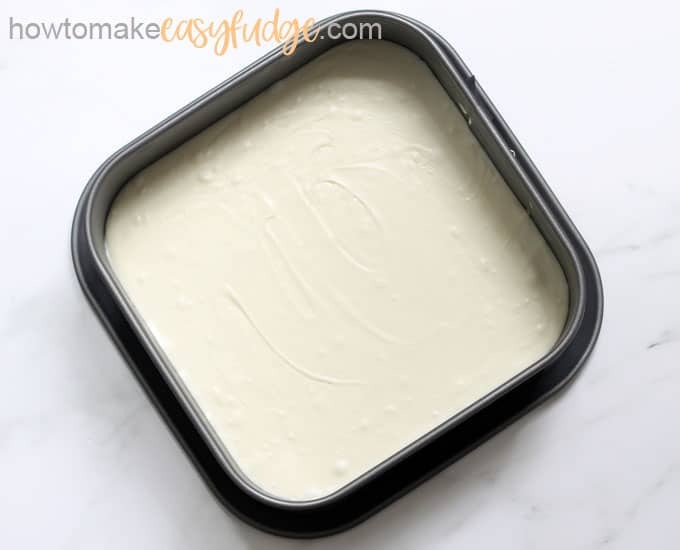 Because of how quickly this easy fudge comes together, vanilla flavored white chocolate fudge (hmm, should we call this frosting fudge?) is the perfect candy to make for parties or to package as homemade gifts. This recipe is either a microwave fudge or a stove-top fudge. 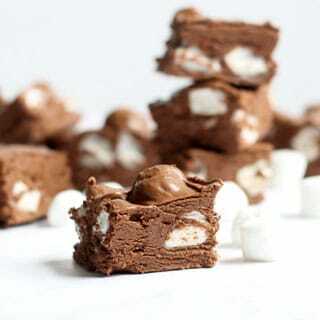 This easy and quick fudge recipe is also the perfect canvas for adding mix-ins, such as nuts, dried fruits, and small candies to really personalize your fudge. 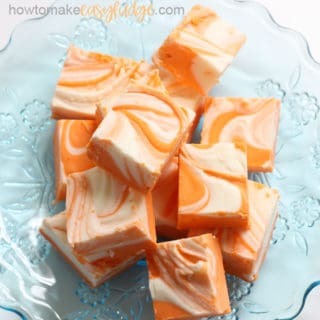 And if you’re looking for a similar fudge, check out this 3-ingredient vanilla fudge. 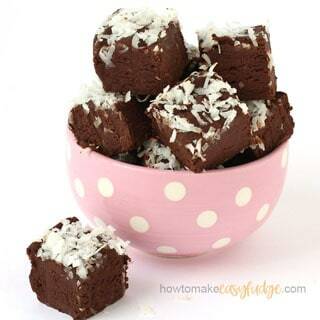 For a basic chocolate fudge recipe, click here. 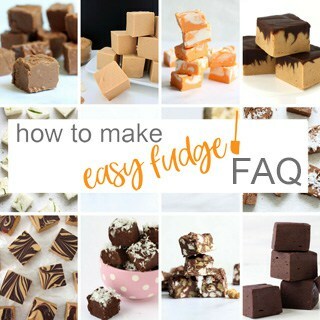 Everything you need to know about how to make fudge can be found on this FAQ page. If you’re using any mix-ins, stir them in here! 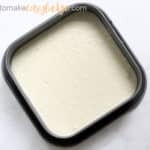 Scrape the mixture into a prepared 9 x 9-inch square pan that has been greased well or lined with lightly-greased parchment paper or no-stick foil. This recipe calls for 2 2/3 cups chocolate chips, which is 16 ounces, so more than a 12-ounce bag. Be sure to buy the big bag (or two small ones). how do I make microwave fudge on the stove-top? Because overcooked chocolate should be avoided, I prefer to make fudge in a double boiler when cooking on the stove-top instead of the microwave. To make your own double boiler, rest a heat-safe bowl on top of a saucepan of simmering water. There should be one to two inches of space between the top of the water and the bottom of the bowl. Place your chocolate chips and frosting in the bowl and stir well until the chocolate chips are about three-quarters of the way melted. Then, remove from the heat and use the residual heat, stirring, until the mixture is very smooth. Then, pour into your pan. The fudge pan should be well greased. I’ve had success with greasing a baking dish (both glass and non-stick metal) with non-stick cooking spray or with butter or shortening. However, my preferred method for preparing the pan is to line the pan with parchment paper or non-stick foil. I lightly grease the parchment or foil with non-stick cooking spray, removing the excess with a paper towel. The benefit of parchment or foil is that when the fudge is chilled, you can lift the fudge out of the container for easy cutting. So you’ll have no trouble at all with this vanilla fudge. what can I mix in to white chocolate or vanilla fudge? This is a great, basic, easy recipe for fudge. You can personalize the fudge to your own taste (or to the tastes of those receiving the fudge as a homemade food gift idea) by mixing in 1 to 2 cups of add-ins. Try nuts such as walnuts or almonds, coarsely chopped. You can also mix in additional small candies such as mini M and Ms or large sprinkles. Try chopping some dried fruit, like apricots. The mix-ins are also a great way to fit the fudge to different holidays. Add dried cranberries for a Christmas fudge. Or orange and black sprinkles for Halloween fudge. 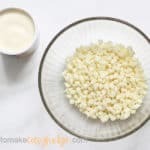 Melting white chocolate chips and a can of store-bought frosting is all you need to do to make the most delicious, easy white chocolate fudge. 2 2/3 cup white chocolate chips (16 ounces) SEE NOTES!!! Prepare an 8-inch or 9-inch square baking pan by lining it with lightly greased parchment paper or non-stick foil. 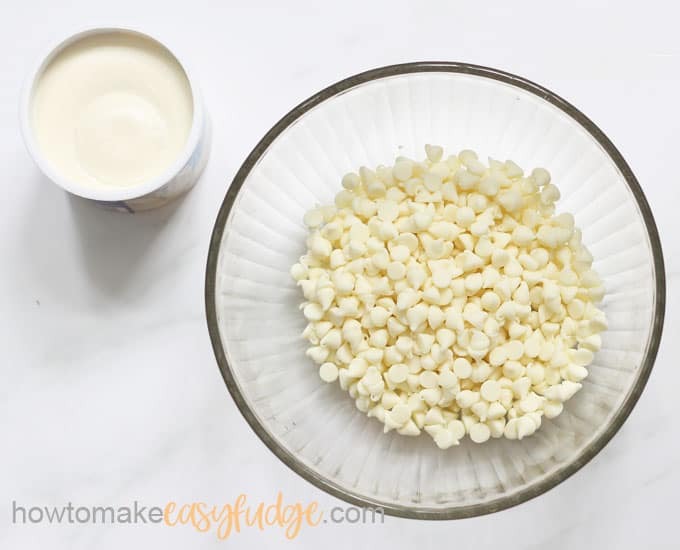 Place the white chocolate chips and the frosting In a large, microwave-safe bowl. Microwave for 90 seconds at 70 percent power. Stir very well, using the residual heat to completely melt the chocolate. If you're using any mix-ins, such as chopped nuts, dried fruit, or little candies, stir them in here. Scrape the mixture into the prepared baking pan. Chill in the refrigerator until well set, 2 to 4 hours. 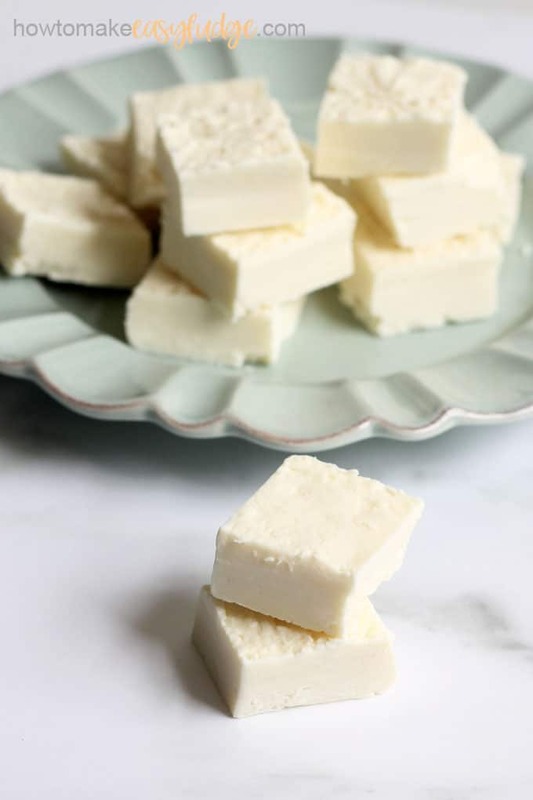 If this white chocolate fudge caught your eye because it has only two ingredients, check out these other 2-ingredient recipes. Whip up pizza with this 2-ingredient pizza dough. Make breakfast a bit healthier with 2-ingredient pancakes. Try this 2-ingredient salsa chicken. 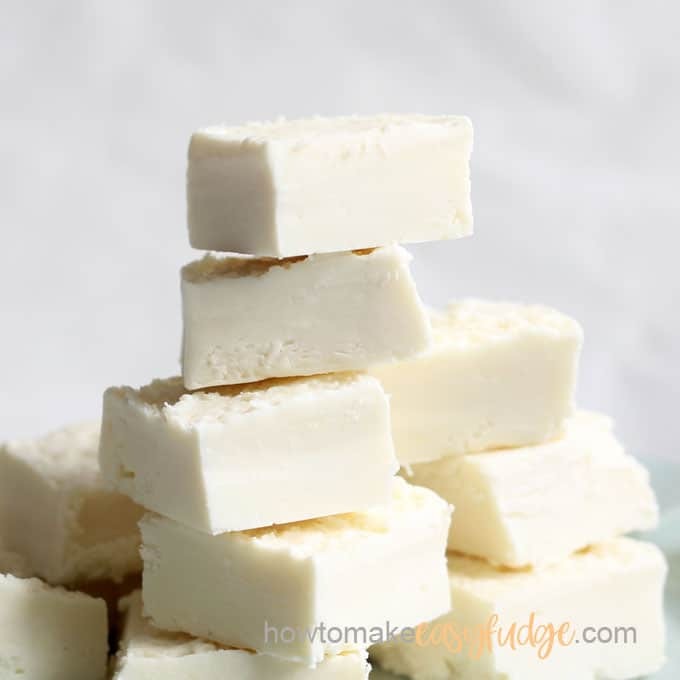 If you try this easy white chocolate fudge recipe, let us know in the comments! Here are some more easy recipes to try. I’ve never had white chocolate fudge before and I can’t wait to try it! I hope you give enjoy it. I love that you told us what to do if we don’t have a double boiler. Thanks! Thank you so much for this seriously simple recipe. I’m not a fan of the flavor of the cans of frosting now but when they are mixed with white chocolate they make a really tasty fudge.